NiTi - Magic or Phase Transformation? NiTi alloys possess exciting properties and are staples in materials demonstrations. The shape memory effect and superelasticity property of NiTi fascinate people, but actually require significant materials knowledge to fully understand the phenomena. 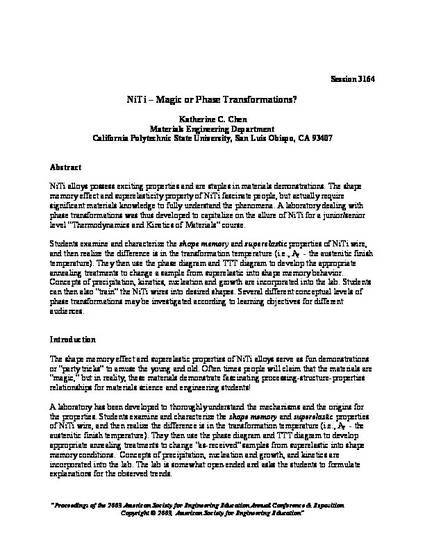 A laboratory dealing with phase transformations was thus developed to capitalize on the allure of NiTi for a junior/senior level “Thermodynamics and Kinetics of Materials” course. Students examine and characterize the shape memory and superelastic properties of NiTi wire, and then realize the difference is in the transformation temperature (i.e., Af - the austenitic finish temperature). They then use the phase diagram and TTT diagram to develop the appropriate annealing treatments to change a sample from superelastic into shape memory behavior. Concepts of precipitation, kinetics, nucleation and growth are incorporated into the lab. Students can then also “train” the NiTi wires into desired shapes. Several different conceptual levels of phase transformations may be investigated according to learning objectives for different audiences.